This two-volume set covers the evidence-based practices now identified for treating children and adults with a wide range of DSM disorders. Volume 1 covers child and adolescent disorders, while Volume 2 explores adult disorders. 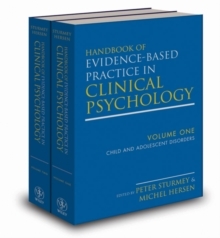 Chapters in each volume provide a comprehensive review of the evidence-based practice literature for each disorder and then cover several different treatment types for clinical implementation. Edited by the renowned Peter Sturmey and Michel Hersen and featuring contributions from experts in the field, this reference is ideal for academics, researchers, and libraries.